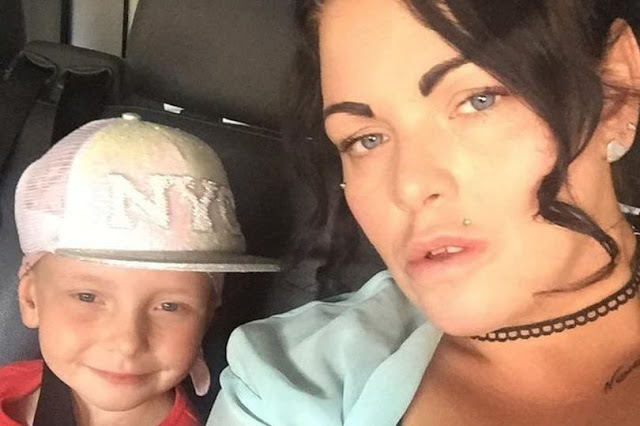 A disgusted mum says she was told to pay for a bottle of McDonald's water given to her young daughter who was vomiting after undergoing treatment for cancer . Beth King's daughter Lola Griffiths-King felt nauseous and began vomiting in the fast food restaurant in Merseyside after having chemotherapy earlier in the day. The mum visited the restaurant on Liscard Crescent, in Wallasey, with seven-year-old Lola and little sister Stella, five, on Saturday. Lola, who has had acute lymphoblastic leukaemia since birth but was only diagnosed in January, asked to go to McDonald's at around 3.30pm. Beth agreed as the youngster has been undergoing "intense chemotherapy" since January and is rarely hungry. Beth told the Liverpool Echo : "Lola said she wanted to go to McDonald's and I said I'd take her because of her condition. "She has zero energy and a low appetite so if she wants something, I tend to let her have it." While Beth and five-year-old Stella were eating, however, Lola, who now weighs three stone and six pounds, began to feel unwell and started to vomit. Her mum believes this is due to her having chemotherapy at 9am that morning. The 30-year-old said: "She hasn't eaten for days, while me and her baby sister [were sitting there] she starts to throw up as her chemotherapy wiped her out for the day. "She was dead embarrassed, she is anyway, as people always stare because she's got no hair. "The cleaner came over with a bottle of water, as Lola can't drink tap water, because she was being sick." But the mum, who is a full time carer for Lola, was furious when the cleaner reappeared minutes later asking her to pay for £1.29 for the water. Beth recalled: "The cleaner came back over and said the manager asked her to collect the money for the water. "I asked for the manager to come and see me herself five times, and waited 40 minutes, but no one arrived." The mum-of-four made her way over to the counter and demanded to speak to the manager, and claims she was met with a staff member who said she knew nothing about the incident. Beth said: "I went over to the counter and spoke to the manager and people in the queue were saying 'that's disgusting' and offering to pay the money themselves, but I told them not to." Since Lola was diagnosed in January, Beth claims this is the first time anything like this has ever happened, and she is "appalled". The following day, the Park Primary School pupil was rushed into hospital after being very unwell. The seven-year-old underwent a blood transfusion last night and has been put into isolation at Alder Hey Children's Hospital . A McDonald’s spokesperson said: “We want our customers to enjoy every visit to McDonald’s and to know how much we appreciate them. "We would never wish to cause upset or distress to anyone who is in need and would always look to make people feel as comfortable as possible when in our restaurants.